What follows are some idle speculations to see if something better than the 2 pdr tank gun could have been fielded at low cost in the run-up to WW2. The 2 pdr was a good hole-puncher for the period, outclassing the German 3.7cm PaK for example, but could not fire an effective HE shell (indeed, these were rarely issued). Nor was it easy to upgrade its performance until the development of Littlejohn squeezebore ammunition early in 1943, which was in any case not without problems. A logical further step is to consider what might follow-on from such a gun. Given the way in which tanks were actually used (as general fire-support platforms at least as often as anti-tank vehicles), the main priority for our alternative weapon would be to greatly enhance the effectiveness of HE shells while at least matching the 2 pdr's AP performance, and at the same time keeping the gun and ammunition small enough to fit into the restricted British tank turrets of the period. The size limitation would rule out a medium-velocity 75+mm gun, so I have chosen as a starting point the 57 x 307R cartridge of the 6 pdr 8 cwt gun – a 19th century naval gun which had been fitted to early WW1 tanks. This cartridge was the about same length as the 3 pdr 2 cwt (47 x 351R) tank gun round used in the 1920s Vickers Medium tank and only slightly longer than the 2 pdr No.2 (40 x 304R). It was significantly shorter and slimmer than the 57 x 441R case of the 6 pdr 7 cwt tank/anti-tank gun which entered service in autumn 1942. 6 pdr 8 cwt; 3 pdr 2 cwt; 2 pdr No.2; 6 pdr 7 cwt. The 6 pdr 8 cwt had a modest performance, driving a 2.72 kg shell at 540 m/s from its L/40 barrel to give 400 kJ muzzle energy (the later, cut-down 6 cwt WW1 tank guns had L/23 barrels and an even lower velocity). However, by the 1930s metallurgy had improved greatly from that of the 19th century, as shown by the fact that the 6 pdr 7 cwt gun weighed 1 cwt (50 kg) less than the older gun despite having a slightly longer barrel and a muzzle velocity of 820 m/s, developing 940 kJ energy (and obviously a far higher chamber pressure). So how much energy could have been squeezed from the 57 x 307R case if fired from a 1930s-designed gun? The nearest comparator is the German 5cm L/42 KwK 38 "short" tank gun introduced in the Pz III, which used a 50 x 289R case about the same size as the 57 x 307R (see comparative photo on the left). The KwK 38 developed 565 kJ muzzle energy. The larger calibre of the 6 pdr would have obtained greater efficiency from the propellant, enabling our new 57 x 307R loading to perform rather better – probably around 645 kJ. It would be advisable to modify the case slightly by reducing the taper so that the case diameter at the shoulder was slightly larger; this would prevent the new high-pressure loading from being chambered in old 6 pdr guns which were not designed for it, while still allowing the new guns to fire the old ammo. The barrel of our new gun would be restricted to 43 calibres because that's all that the available machinery could cope with at that time, but the shorter chamber compared with the 57 x 441R would have resulted in a slightly longer bore. So that's the basic parameters sorted, now lets turn to the new ammo. A muzzle energy of 645 kJ would punt the standard 2.72 kg shell out at 690 m/s (for comparison, the German 5cm L/42 fired a 2.04 kg shell at 745 m/s). However, I would want to adopt the approach the Russians took with their 1930s 45mm tank/AT gun, and choose an HE shell which is much longer and heavier than the AP type and is fired at a lower muzzle velocity (see photo of the 45 mm HE and "arrowhead" APCR projectiles on the right, lined up so that their driving bands are next to each other). The new gun would be able to fire the old naval ammo for low-cost training (and in combat, in an emergency) so it makes sense for the new HE loading to match the original trajectory. That means a muzzle velocity of 540 m/s, which for 645 kJ energy would mean a shell weight of 4.42 kg (9.7 lbs). However, this is probably a bit high since such a long shell would penetrate deeper into the case, reducing the space for propellant, so we'll call it around 4 kg; that's a 50% increase in the shell weight and effectiveness over the standard 6 pdr, and a 360% increase over the 2 pdr. The shape of the shell would be fiddled with to match the ballistic coefficient of the naval shell, so the same sight settings could be used. The nose fuze would be settable to instant action (for fragmentation effect against troops) or delay (for blast effect within buildings and vehicles). Now to the AP ammo. Firing the standard 2.72 kg shot at 690 m/s would deliver respectable penetration by early-WW2 standards, but a rather curved trajectory. On the other hand, APDS was insufficiently advanced at that time to be reliable. So I'd go with APCR (HVAP to Americans) in two versions: Mk I with a hardened steel core, and Mk II with a tungsten carbide core. The two versions would be designed to have the same weight, muzzle velocity and external ballistics, the main difference being that the penetrating core of the Mk II would be slimmer to keep the weight the same, offering something like a 50% increase in penetration over the Mk I. The diameter of the tungsten core of the 6 pdr 7 cwt APCR was 28mm, meaning that a steel-cored version would measure around 40mm. The light-alloy full-calibre sleeve would be as aerodynamically shaped as possible, and would have a boat tail with a tracer to provide some base-bleed effect as well as indicating the trajectory. Ideally, there would be a large nose cavity stuffed with incendiary which would not only add to the general mayhem but indicate a hit with a bright flash. What kind of weight, muzzle velocity and penetration are we talking about? I wouldn't want to use a super-light, very high velocity APCR shot because they had problems with shattering at short range and a rapid fall-off in velocity (and therefore penetration) at long range. A tungsten-cored APCR round with a decent long-range performance was developed for the 6 pdr 7 cwt, although it saw very little use. This weighed 1.8 kg and was fired at 1,080 m/s (see this article for more information on 6 pdr 7 cwt performance). This seems a reasonable weight, and with 645 kJ to play with in our less powerful gun would deliver 850 m/s (that's just under 2,800 fps in old money). That's not bad at all, matching the flat trajectory of the 2 pdr. Penetration involves rather more guesstimating because of the variables involved, but given that the 6 pdr 7 cwt APCR is credited with penetrating 90mm at 1,000 yards and at a striking angle of 30 degrees from "normal" (vertical) - conditions used for all of the penetration figures in this article - it seems feasible to suggest that our MK II ammo with a similar projectile could manage around 70-75mm under the same conditions, which would mean about 50mm for the steel-cored Mk I. This compares with 40-42mm for the standard 2 pdr AP and 45-50mm for the later APCBC. The 50mm KwK 38 penetrated around 40-45mm for APC ammo and about the same for PzGr 40 APCR (which being light and fast – 0.95 kg at 1,050 m/s – did much better than the APC at short range but had lost a lot of velocity by 1,000 yards). So there we have it: a compact, low-cost solution to the small-tank armament problem, which would deliver an HE shell of useful size while remaining an effective penetrator for much of the war - the MK I APCR matching the standard 2 pdr APCBC in both penetration and trajectory, with the Mk II APCR matching the performance of the 6 pdr 7 cwt firing full-calibre steel shot. The next question is: what would follow-on from it? Historically, the 6 pdr 7 cwt took over from the 2 pdr, but while mating the bigger 7 cwt case up with our APCR projectiles would deliver some improvement in penetration over our "compact" 6 pdr (to around 90mm as indicated above) there would be no improvement in the HE performance which war experience showed to be critically important. A calibre of at least 75mm would be necessary to boost the HE sufficiently, but the AP shot must also deliver a substantial improvement in penetration for the new tank gun to be worthwhile. The history of what actually happened next is a catalogue of planning errors and more or less happy improvisation. After considering an 8 pdr gun (which offered insufficient advantage over the 6 pdr) Vickers developed plans for a 75 mm L/50 High Velocity (HV), based on the 3 inch 20 cwt AA gun cartridge (76.2 x 420R) which entered British service in WW1 and was still very much in use early in WW2 (the AA gun was much lighter than the new 3.7 inch AA, so was preferred for mobile use). Vickers slightly modified the case by necking it down from 76.2mm to 75mm in order to take the US Army's M61 APCBC and M48 HE shells used in the M2 and M3 tank guns which armed their M3 (Lee and Grant in British service) and M4 (Sherman) tanks. The M61 weighed 6.77 kg and was fired at 808 m/s from the Vickers HV for a muzzle energy of 2,200 kJ, compared with 620 m/s from the US tank guns (1,300 kJ). As a result, penetration went up from about 60mm to an estimated 87mm - not a huge amount more than the 6 pdr 7 cwt, but with a vastly more effective HE shell. The M48 was downloaded to only 457 m/s since the thin-walled shell could not take the same high chamber pressures as the M61. It is worth noting here that both the 17 pdr (initially) and the US 76mm tank guns fired HE shells at the same high velocity as the AP shot, which simplified gunlaying but meant that they had to have very thick shell walls and therefore much less HE, considerably reducing their effectiveness (the 76mm M42 HE shell contained only 390g TNT compared with 667g for the 75mm M48). Incidentally, the 2 pdr HE shell contained 65g and while the filling weight of the actual 6 pdr HE has so far escaped me, scaling from the German 5cm HE indicates that our thin-walled 4 kg proposal should have been able to contain around 350-400g. The Vickers 75mm HV was supposed to fit in the new Cromwell tank, but it was discovered rather late in the day that the Cromwell's turret was too small, causing a major crisis. Fortunately, this was partly resolved since it was realised that, by a happy coincidence, the diameter of the 75 x 350R US case was almost exactly the same as that of the 6 pdr 7 cwt, so it was a relatively simple job to redesign the 6 pdr gun to take the US 75mm ammunition. This was duly done, to the benefit of HE performance but with some loss of penetration. The other improvisation was to fit the formidable 17 pdr anti-tank gun into the M4 tank, to create the Sherman Firefly. Meanwhile, Vickers persevered with their 75mm HV and the next tank, the Comet, was designed around it to make certain that it would fit this time! Before it could enter service, it was decided to take the calibre back up to the original 76.2mm so that the new gun could use the same projectiles as the 17 pdr, and the gun was then renamed the 77mm (presumably to distinguish it from the US 76mm). The Comet turned out to be a very good all-round tank and although it did see action in 1945, it arrived too late to make much difference. The photo on the right shows (from left to right): 6 pdr 7 cwt APDS (57 x 441R); 75mm US/UK tank (75 x 350R); 17 pdr APDS (76.2 x 583R) and 77mm APCBC (76.2 x 420R). So, what specification should we select for the ideal follow-on to our "compact" 6 pdr? As we have seen, we need at least a 75mm calibre to provide adequate HE capacity, but penetration substantially greater than the compact 6 pdr's. The immediately obvious point is that a gun firing such ammunition could not fit into the small turrets of any British tank up to the Comet. The first requirement is therefore to increase the size of the turret ring to that of the Comet much earlier, with the aim of getting such a tank in service by 1942/3. 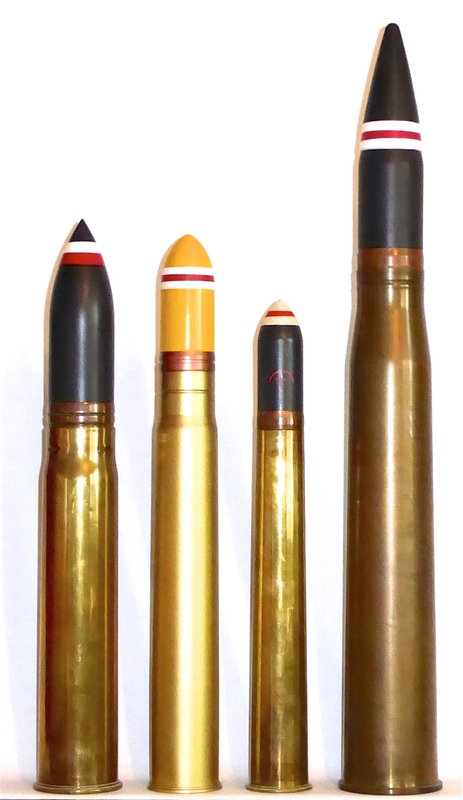 To develop our new gun and ammunition as quickly as possible, it makes sense to do just what Vickers did with the 75mm HV and adopt the existing 76.2 x 420R cartridge case of the 3 inch 20 cwt - but with different projectiles (the calibre might as well stay at 76.2mm). These would simply be scaled-up versions of the ones designed for our compact 6 pdr. So the standard AP shot would be a steel-cored APCR to start with, followed by a tungsten-cored version later. The HE shell would be a big, high-capacity type fired at a much lower velocity. As with our new 6 pdr cartridge, the much higher pressure of the tank gun ammunition would make it advisable to straighten the case a little, which would not only ensure that the old 3 inch guns couldn't fire the tank ammo, it would also increase the case capacity, making room for a little more propellant. What performance would we be talking about for our "new 77mm"? Applying the same "multiplier" to our long HE shell as we did with the 6 pdr compact would result in a weight of just over 9kg (20 lb) which, given that it could be a thin-walled design since it would be fired at a low velocity of maybe 500 m/s, could contain around 900g HE, providing a healthy 35% advantage over the M48 and over 100% more than the high-velocity 76mm and 17 pdr HE shells. When it comes to penetration we have a close match for the tungsten-cored AP in the form of the US 76mm HVAP. 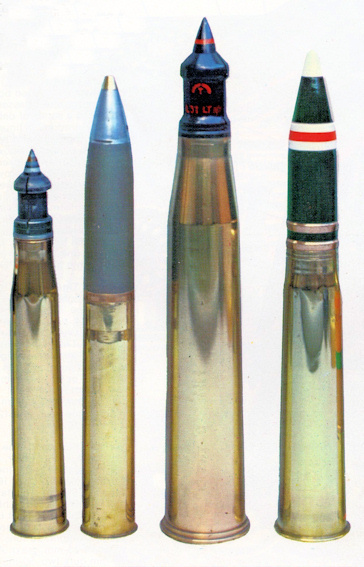 The US 76mm cartridge case developed almost as much muzzle energy as the UK 77mm (2,200 kJ compared with 2,400 kJ); it was longer at 539mm, but narrower with a 93mm rim compared with 116mm. The HVAP shot weighed 4.26 kg and was fired at 1,036 m/s (3,400 fps), penetrating 134mm. Allowing for the slightly higher muzzle energy of the 77mm, the MV would be about 1,060 m/s, delivering perhaps 140mm penetration. Assuming that the steel-cored Mk 1 version would penetrate only two-thirds as much, that would make it around 95mm. The penetration of the tungsten APCR looks about right, but the steel one looks a little disappointing compared with the US 76mm's APCBC which managed 90mm, not to mention the 77mm's historical APCBC shot which penetrated 108mm. So the 95mm figure might be regarded as a minimum, with a higher performance achievable. Would the 17 pdr still be needed as a tank gun given our "new 77mm"? Probably not, given that APDS was ready for service by 1944 - and the 77mm with this ammo could penetrate 165mm.